I use axons at the crayfish neuromuscular junction (NMJ) as a model system to study the excitability of axons and synaptic transmission. Axons typically branch multiple times before making synaptic contact with other neurons. 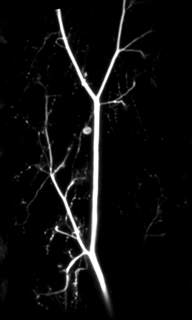 The terminal branches are typically very thin, < 1 mm in diameter, and preclude direct recording with microelectrodes. A unique feature of my research concerns use of a voltage indicator, to enable monitoring of action potential (AP) in fine braches not accessible to microelectrodes. Thus, by combining microelectrode recordings and imaging, my research projects focus on functions of sodium and potassium channels on axonal excitability and the role of these channels on synaptic transmission. Axons at the crayfish NMJ, with their extensive branching, are morphologically similar to those in the mammalian brain. Therefore, the relevance of my research program is to further the understanding basic principles governing information processing in branching axons. To students in my class: need help with electrophysiology? Try "Tutorial on electrophysiology: FAQs on membrane potential, action potential and synaptic potential" by clicking on the book cover below. 1. Replacing arc lamps with high power LED. 2. Design and use of a "pinch" to electrically isolate a segment of axon.